The earliest permanent settlements in Cumberland County were along the Cohansey River. Between 1680 and 1700, settlers had begun to carve out of the South Jersey wilderness a home for themselves and their families. By 1700, Back Neck and Fairfield on the south side of the river. This area would later become part of Fairfield Township. In May of 1697, a group of potential settlers from Fairfield, Connecticut purchased a tract of land in Cohansey. The Provincial Assembly voted that the township be called Fairfield and empowered it with the privileges of other townships. It was one of the six original townships of Cumberland County. Originally, the area of Fairfield included what are now Fairfield, Lawrence, Downe, Commercial Townships, and a part Millville, west of the Maurice River. The first settlers from Fairfield, Connecticut and Long Island called their settlement, New England Town and located it at the head of the present day New England Cross Roads. On June 10, 1697, these settlers formed the First Presbyterian Church of South Jersey. Today a granite monument (dedicated 1909) stands on the site of their first log meeting house. The cemetery which adjoined the meeting house remains the oldest in the township. Around 1717, a frame meeting house with shingle siding replaced the log one. By 1775, the building was declared unsafe so the congregation purchased the ground where the Old Stone Church still stands. Although, the building was not yet complete, the first sermon was heard on September 7, 1788 when Reverend Ethan Osborn assumed the pastorship. He remained until 1844. In 1850, He returned to the Old Stone Church to give the last sermon before the congregation moved to their new church in Fairton. A parsonage fire in 1730 destroyed the early church records. Baptists and Methodists later settled in Fairfield. The first Baptists in the Country formed the Cohansey Baptist Church at Back Neck. It is quite possible that Methodism reached Fairfield via the Methodist Circuit Riders, however, the earliest record of Methodism was in the late 1790’s. Michael Swing, the pioneer Methodist Preacher purchased a farm at New England Town in 1790 from the Reverend Daniel Elmer. The Year 1791 officially marked an organized Methodist Society with Micheal Swing ordained as the local Preacher. 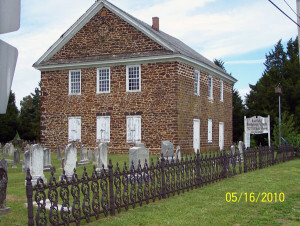 A Methodist Meeting House was built during 1819-20 on the road from Fairton to Back Neck, directly in front of the old graveyard of the Fairfield Presbyterian Church. As long as it existed (1866) the church was known as “Swing’s Meeting House”. The new church was built in Fairton Village and dedicated on January of 1867. The first school in Fairfield was located at the crossroads of Burlington Road and the Fairton-Millville Road. 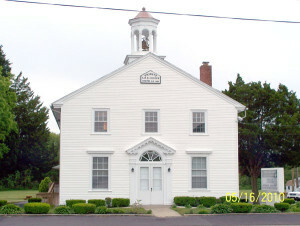 Bennett Town School as it was known was sponsored by the Old Stone Church. It served the children from Gouldtown as well as the area south of Gouldtown. Other schools in the history of Fairfield Township were: A one story, one room, wooden schoolhouse built in 1851 in Back Neck. Three years later, a second schoolhouse built on Herring Row Road, the Gouldtown School, 1832, a wooden two room building, and in 1869, the Fairton School, a two story, two room structure accompanied by two suitable outhouses. In 1733, Watson’s Ferry connected Greenwich with Fairfield Township. In 1767 the ferry was taken over by John Sheppard. For many years, the ferry was powered by a horse located on the Fairton side. Economic pressures put the ferry out of business in 1838. During the days of commercial shipping, several wharves held prominence within the township. The first was the Donaghay-Dailey Landing at the site of the Cohanzick Country Club. The chief export was corwood, firewood and salt hay farming cut by the Gouldtowners during the winter. Vegetables, salt, and hay were the other products which were exported. The salt hay was used by glasshouses for packing. It was destroyed during a heavy storm and never replaced because the railroad had reached Bridgeton by this time (1861) and freight service shifted to rail. By 1875, the Bridgeton and Port Norris Railroad was completed and Fairfield had freight service. Laning’s Wharf has had a long history. It provided both passenger and freight service between Bridgeton and Philadelphia. Until the 1920’s, tomatoes were shipped to Camden and Baltimore canneries. Tyndall’s Wharf served the people of Back Neck for a period of 100 years until 1908. This wharf serviced the larger ships which found it too difficult to “tack” as far as Bridgeton. This was the only commercial wharf in the country not located on the Cohansey River. The first industries of the township were common to all early settlements. Samuel Fithian owned 1/8 share of the grist mill and the saw mill built at Forke Creek before 1702. The other owners are unknown, but it is believed that these mills were probably held in common—as would have been the practice in New England at that time. Previous to 1763, the site of the mill-dam was moved to near Clark’s Pond Road. David Clark assumed ownership of the mill property sometime after 1759 and owned it until 1843 when he sold it to John Trenchard. Trenchard moved the mill to its present location on Fairton-Bridgeton (Route 9) and built a raceway to bring water from Clark’s Pond to the mill. This raceway is still there, but it has been drained to be used as a walking trail. At one time, machine stops, a spindle factory, and other industries lined the raceway. John Trenchard, in cooperation with Curtis Edward, also operated a blacksmith shop which was located on the old road from Bridgeton to Fairfield at Rocaps Run. This was not the first blacksmith shop, however. The first was located at the present site of Railroad Avenue, in present-day Fairton and was operated by James Campbell, Sr. It was later moved to the corner of Main Street and Seabreeze Road. Furman R. Willis’, beef and pork packing business was the principal industry during the 1870’s. The public wharf in the center of Fairton was a busy port during the sailboat era. Goods shipped included lumber, oysters, fish, and vegetables. Fairton has had an active part in boat building throughout the years. Between 1850 and 1897, three sloops were built. Furman R. Willis was also a partner in the Gibson-Horton Glass Company which was built in 1888, in Fairton. By 1890, he sold his interest and in 1892 the factory was moved to Bridgeton. In 1892, Mr. Willis formed a partnership with Azriah More of Bridgeton and built a pot-furnace and tank glass house built on Rattle Snake Run on Elmer Avenue, just above his meat house. Hollow ware was produced. It was sold to the Woodbury Glass Company. This building was later torn down after several years of standing idle. The first road in the county (1697) was Old Burlington Road, which connected New England to Burlington, Gouldtown is, itself, a unique community. It was founded around 1700 by Benjamin Gould his marriage to Ann (a Finn). He was the youngest of five children by Elizabeth Fenwick Adams and a man of color named Gould. Elizabeth Adams was the granddaughter of John Fenwick, the proprietor of Salem County. Other Mulattos soon settled here. Anthony and Richard Pierce came here from the West Indies on a merchant ship and stayed. They paid the passage of two Dutch women who became their wives. The Murrays came here from Cape May and claim a Lenape Indian ancestry. Othniel Murray married a Swede named Katherine. Before the Revolution, these three families had intermarried among themselves and with other white settlers. The early inhabitants were members of the Old Stone Church. Soon after the African Methodist Church was founded in Philadelphia in 1816, the Trinity AME Church was formed. In 1823, they purchased the Westcott Schoolhouse and moved it to the site where the present-day school is located. This building served as both school and church to the community. The three-room school, which has grown into what is now known as the Fairfield Middle School, provided the educational foundation for hundreds of children, many of whom continued their education and became professionals in many fields. Respect and cooperation between parents, teachers, and children were the prime factors. After 1805, Gouldtown became the site for the toll gate on Bridgeton-Millville Road. The Toll House was located just west of the church on the road to Bridgeton. Traveler’s were required to stop and pay a toll. A trolley ran from Bridgeton to Millville providing transportation for the citizens of Gouldtown. A post office was situated on the corner of what is now Route 49 and Gouldtown-Fairton Road. Its’ last post-mistress was Mrs. Anna Gould Pierce. A few years later, a grocery store was built across the road, with Mr. Charles Bryant, proprietor. There were two other settlements in Fairfield. The first was founded in 1732 and was known as Kill-Pig-Hole. So named, when a pig got caught in quicksand in the late 1800’s. By, March 1870, the inhabitants gathered to vote to change the name to Rockville. The other settlement was Fairton. Fairton was situated on Mill Creek and Rattlesnake Run. Up to the time that a post office was established on January 1, 1806, it was known as Bumbridge because the bum-bailiff fell through the bridge while attempting to arrest a person. Oystering was the main occupation of Fairton’s inhabitants. During the steamboat era in 1877, two enterprising gentlemen from Gloucester bought 120 acres and built an amusement pavilion and steamboat landing in what today is known as Sea Breeze. At the same time, they rebuilt a Civil War ordinance boat under the name of “John A. Warner”. Daily excursions were run from Philadelphia to Sea Breeze during the summer. The Warner House was completed in 1887. It was a 40-room hotel, complete with a well-equipped bar. The hotel became famous for its food, attracting day parties from Bridgeton. At that time, Sea Breeze was a two-hour ride away. The resort provided bathing, fishing, crabbing, billiards, bowling, dancing, quoits, and horseshoe pitching. A merry-go-round delighted the children. The annual clambake attracted many boats which participated in boat races. All this excitement was short lived because in 1890, a fire destroyed the hotel. Sometime during the early decades of the 20th century, another hostelry, dubbed the Seabreeze Hotel (as the name came to be spelled more often), was built by Jesse Smith, an one-armed, tee totaling trapper. The late Rulaon D. Brooks took a photograph of the structure (possibly in 1926 when it still may have been in an unfinished state), which reveals it to have been a long, two-story frame building with a single-story porch running most of it’s length. The newer hotel reportedly burned in the 1940’s. Late in 1929, Harry Griffith, then about 50 years old, located there. By the next year Harry began to rent out rowboats to fishermen and also did his best to wet their whistle. As soon as Prohibition ended, Harry went legitimate and obtained a license to dispense alcoholic beverages. At first this tavern operated from a barge with a three-room building added to it. Harry meanwhile lived in the house built onshore. His daughter, the legendary Mae Griffith, joined the business and by the 1940’s added food to the offerings of what came to be called the Seabreeze Tavern that was built on the beach. Mae continued to operate the popular spot even after her dad passes away in 1960’s. Dolores says the tavern survived until it was dealt a fatal blow by Hurricane Gloria, in 1985. Two houses of unique architectural character have been nominated for inclusion on the National Register. The Buck House (also known locally as the Pirate House and as the Sheppard House on its formal application) is a 2 ½ story brick (imported from England) of the Federal style, built in 1781. The other is the Brick House Farm (Sheppard House) which was built in 1736. The oldest section of this house is located closer to the Cohansey River. It is built of Flemish bond brick. Several additions have since been constructed. At one time, a large creamery functioned on this property. To date, Fairfield claims two structures, listed on the National Register of Historic places. (1) The Old Stone Church and (2) the Spindrift Sailing Yacht, c 1882. The history of Fairfield Township culminates to bring us the Fairfield we know today; a blend of tidal marshes, open fields, and small communities.